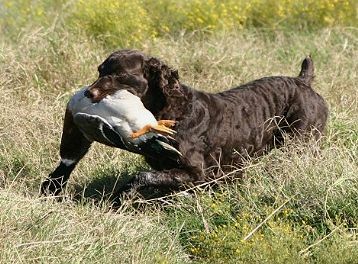 Just a few weeks ago at College Station, Texas, Mule - a tenacious, trail blazing Boykin spaniel became GRHRCH UH Just Ducky’s Justforkicks. Mule is the first Boykin ever to earn the Grand Hunting Retriever Club Champion title. Many may have had doubts that a Boykin could achieve this coveted, top-level UKC Hunting Retriever title, but when you realize that Mule has done so - and at just three years old - it is, indeed, an astounding feat. Talking to owner, Chris Meurett of Charlotte, North Carolina, it quickly becomes evident that this isn't an ego trip - it is truly about providing the dog with the skills and opportunities to go as far as his talents and abilities will allow him. It's about raising the bar and setting an example for other outstanding dogs in the breed to follow. "I just wanted Mule to be competitive and put in a good show," Chris explains, "to show people that something other than a lab can compete - and to represent the breed well." 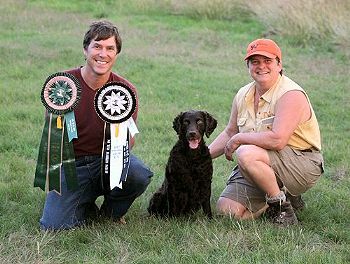 The amazing journey began in early 2001 when Chris approached Pam Kadlec, owner of Just Ducky Kennels and Spaniel Training Academy at Edgefield, South Carolina. He was in search of a Boykin spaniel that he could train and run in UKC’s Hunting Retriever Club events. Pam selected Mule from a litter born that March which was produced by HR Just Ducky Justasample and Twisted Creek’s Drake, the 2000 Boykin Spaniel Society National Intermediate Champion. "At twelve-weeks of age, Mule would sit with his back to you, facing the water and stare intently out to the horizon - waiting for something to fall that he could fetch," co-owner, Pam Kadlec recalls. "He would leap off walls, docks and steep banks with only one thought - fetch! This unique pup held a straight line to and from any mark, over points and through cover without a single thought about running the bank. This special talent is rare in any breed and particularly so in a spaniel where quartering is a natural habit. And he would do so, coming and going." "Sweet, affectionate and calm in the house - yet Mule is extremely courageous with a tremendous passion for work." Chris beams, "He’s not bothered by anything." Giving credit where credit is due, "Chris did ninety-percent of the training," Pam remarks. She participated in readying Mule with some basic handling drills. It paid off when, at just fourteen months old, Mule achieved his HR title after passing four consecutive Seasoned level tests. Believing that Boykins have a lot more capabilities than people give them credit for, Chris set a goal: to go beyond whatever a Boykin has done before. And he set about preparing Mule for the next step. He consulted professional trainers - and then trained two to three times a day. Running in the Finished level, Chris was handling Mule at a Hunting Retriever Club event in Alabama with two passes under their belts when they caught the eye of Charlie Jurney. Based out of Terrell, North Carolina, he is a professional gundog trainer-handler with successes on both the HRC and NARHA circuits. Jurney is know by his kennel name of Beaver Dam. They struck up a conversation and Charlie offered his assistance. It was March 1, 2003 - just one day before Mule’s second birthday - when he earned his HRCH after completing his final Finished pass - making him the youngest of any spaniel breed to achieve this title. "When a dog truly handles, they are telling you that they trust you. Therein lies a big difference between Mule and the rest of the spaniels I’ve trained." Chris’ goal of "making an impact with Boykins" - to take Mule as far as his abilities would allow was the impetus that brought the call to Charlie. He agreed to evaluate Mule’s potential - both physically and mentally - for running in the Grand. Charlie is a seasoned pro who has a considerable amount of practical knowledge of Boykins, having worked training them for about twenty years and putting NARHA Master Hunter titles on some. It would take a lot to impress him - and impress him, Mule did. His assessment? 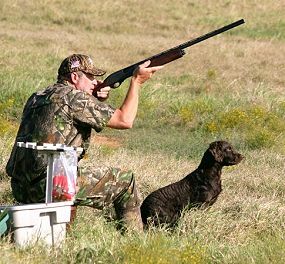 "Mule’s ability to mark fallen birds was outstanding for a Boykin," Charlie notes, "with distances comparable to labs. And he has an enthusiasm to retrieve." He credits Mule’s marking ability to great eyesight and partly due to his height. At 19" tall and tipping the scales between the 42-45 lb range, he is a large Boykin. Most Boykins are about 35 lbs and up to 18" tall. Because Boykins are small, "Coming to the line is a distinct disadvantage," Pam explains. However, in Mule’s case, his size has worked to his advantage - especially when one considers that the Hunting Retriever Club judges are setting up their tests with Labrador retrievers in mind - enabling him a better view of the fall. At just over two and a half years old, Mule began intensive training with Jurney. He concentrated on polishing the Boykin’s ability to run long complex lines. They worked on handling and blind retrieves - and were competing together as a team in only a matter of weeks. "Charlie is an amazing dog guy who believes in understanding what’s in the dog’s mind," Chris’ respect for the trainer’s abilities is obvious. He's grateful for the effort, expertise and dedication that both trainers provided for Mule. "Pam was a huge help through the begining. Charlie did the vast majority of the training after the HRCH - but it's always been a team effort." "Water blinds always separate the men from the boys. His were perfect." Deciding to run a spaniel in a HRC Grand test is not an easy road. It is a tough challenge. Perhaps the most difficult thing for spaniels, in general, when running in retriever events is control. "Spaniels often choose to follow their own instincts rather than trust their handler," Charlie offers some insight. "When a dog truly handles, they are telling you that they trust you. Therein lies a big difference between Mule and the rest of the spaniels I’ve trained." "Mule is obsessive about going to work. We have a workmanship relationship," Charlie describes the Boykin’s attitude towards training. "He gives everything he’s got, every time. Mule’s a true freak - atypical of the breed. The coolest thing about him is when you take him in - and he is a couch potato." With sincere admiration, he adds, "He’s as good a dog you’ll ever find." Mule ran in just three HRC Grands, earning two passes for his title. "It’s amazing watching Mule crash through lab cover," Pam recalls his Grand performance. "To see him stop on a whistle at a distance and steer so well on blinds - it’s incredible how he will line a blind on one whistle - that may take labs four or five." "The fourth series water blind was exceptionally difficult. It took out one third of the field," observed Charlie. "Water blinds always separate the men from the boys. His were perfect. I ran seven dogs and he out performed every dog on the truck." Mule’s string of "firsts" continued. At the end of November, Chris had more news to share. "Mule made it into the HRC 1000 point club. He is the only spaniel of any type to do so. 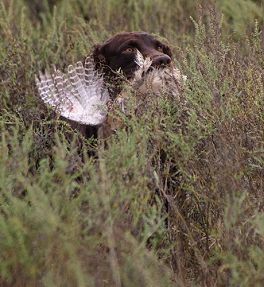 He has two grand passes, 54 finished passes and 13 upland passes as well as numerous boykin field trial wins and placements. He is now preparing for the Super Retriever Series - the Great Oudoor Games qualifier." "He has accomplished more as a Boykin than any lab I’ve known." Looking into the future, Charlie says, "Mule should peak at between four and six years. We have a long ways to go before we see the best he has to give us." What’s next? Chis plans to continue running Mule - just for kicks! Loretta Baughan is the Founder, Editor and Publisher of Spaniel Journal. She is an award winning professional photographer, webdesigner and owner of the Autumnskye kennel. 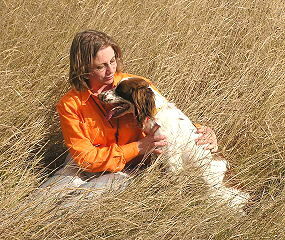 Loretta raises, trains and hunts her English springer spaniels. She is a member of the Northeast Wisconsin Spaniel Club. Loretta resides near Merrill, Wisconsin, with her husband, Steve, and their three children.